This product is a MODIFIED constructed-response question assessment in the format of the new New York State Regents examination in Global History and Geography rolling out in 2019 and 2020. It is designed for my special education students who read at a 5th-6th grade level. The documents have been re-composed at an upper-elementary reading level. This is very useful for weak readers and could be used for a whole class for training purposes. It would eliminate reading level as a variable. This product is a complete part II as would be on a NYS Global History and Geography Regents examination. That is, there are two pairs of documents with the accompanying questions. A "set" consists of two pairs of documents. The format is based on a prototype examination provided by the NYSED and includes updates made in 2017 to the wording of these questions. These are items such as will appear on part II of the new Regents Exam for 17% of the students' Regents score. I am creating these for my students in both Global 9 and 10 because there are no old exams to use for Regents review for this new examination. We do one set at the end of every topic through the year. This is a rare and unique product and time consuming to create, so it has been priced accordingly. 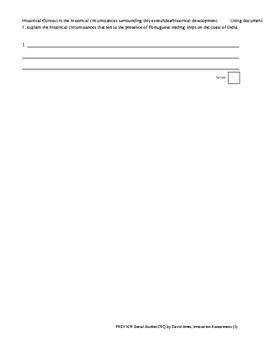 Constructed response question sets consist of a pair of documents with three questions. Question 1 addresses the historical or geographic context of document 1. Question 2 addresses the reliability of document 2. Question 3 asks the student to use both documents to examine cause-effect relationships, compare-contrast analyses, or a turning point. 2. 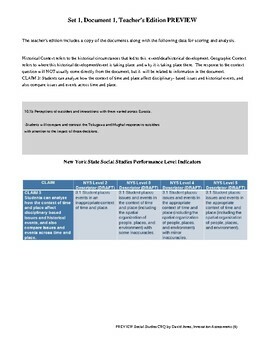 Teacher version of the assessment in PDF format named CRQ391392t.pdf with full citations referencing NYS Social Studies Frameworks, claims and performance level descriptors, and suggested answers in an answer key. 3. My own grading rubric for scoring on a scale of 100 for classroom use is included in the teacher's edition. 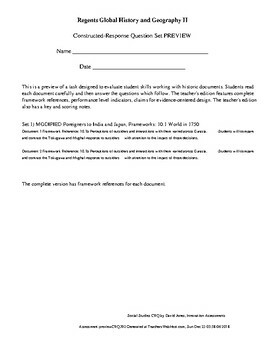 Rubric includes explanation of using the new Performance Level Descriptors to assess student work on this task. On the Regents, there will be no partial credit for student responses to each of these questions, but in the classroom I make some distinctions for variations on response quality for training purposes and for scoring on a scale of 100. Sold separately: regular education version. 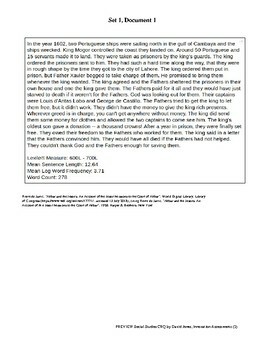 These assessments were generated using apps such as found at TeachersWebHost.com, an assessment website that integrates nicely with Google Classroom or just as a stand alone online assessment suite.